Wow. Maybe now I understand why I feel equally compelled to make art as a hobby and write about religion as a profession – evolution made me do it. Perhaps it also explains why I so often find myself writing about the intersection of religion and art. This is a fascinating read that underscores why many people derive such a deep sense of peace and satisfaction from making prayer beads – or anything else. It is not so much that we want to stand out as unique, but that we want to be drawn together with others in an appreciation of beauty. I just came across this wonderful post by someone called “Gunfighter” on his blog, “The View From Here.” Gunfighter is a law enforcement officer and Lutheran who, for a hobby, makes Anglican/Episcopal and Catholic rosaries. When he posted photos of some of his creations on his blog, people encouraged him to try and sell them. Now, his work is sold at Washington National Cathedral! Way to go, Gunfighter. Every major world religion has some tradition of counted prayer. And in all of these religions save one, these prayers are counted on beads. For Hindus, Buddhists, Muslims, Catholics and Protestants, prayer beads form a link between these diverse faiths and varied cultures. My name is Kimberly Winston and I am a freelance religion reporter and author of a new book, Bead One, Pray Too: A Guide to Making and Using Prayer Beads. Among the forms of prayer beads I explore in the book are Hindu and Buddhist malas, Islamic subhas, Catholic rosaries, Anglican and Episcopal rosaries, Lutheran prayer beads, the ecumenical rosary and the Pearls of Life. The book is both practical – explaining how to make several forms of prayer beads and suggesting prayers for them – and personal – documenting my own spiritual journey with prayer beads. Bead One, Pray Too will be published in April 2008 by Morehouse Publishing. The purpose of this blog is to begin a conversation with my readers and others who are interested in or use prayer beads of any kind. I hope we can share ideas on how to make different forms of prayer beads, either traditional or original, and on how to pray with them. 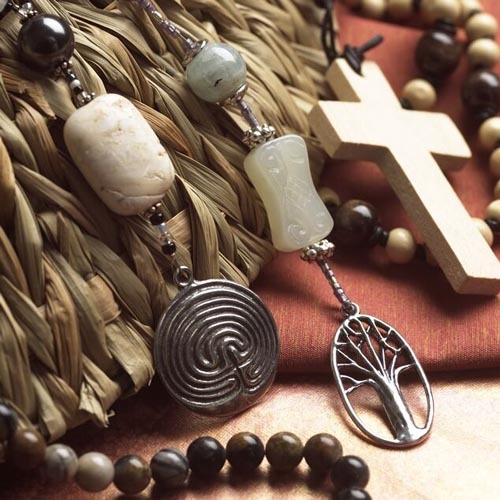 On this blog, I also plan to interview people of different religions about their prayer beads, how they use them and what they mean to their personal spirituality. We will talk to Catholics, Protestants, Buddhists, Hindus, Muslims and Neo-Pagans, including Wiccans and Druids. And while Judaism has no tradition of prayer beads, we will learn about the tzitzit – special knotted fringe on tallit, the Jewish prayer shawl – that are fingered during certain prayers. The purpose of these interviews will be to highlight the common thread that prayer beads and counted prayer represent to members of these diverse religions. I am brand new to the world of blogging and I am sure I will make some mistakes. I ask your patience and indulgence as I find my way through the blogging world.